InterSystems IRIS Data Platform™ dashboard technology enables you to create web-based dashboards for your end users. Among other items, dashboards can display KPIs (key performance indicators). In general, a KPI is a query that can be executed and displayed on dashboards; when the dashboard is displayed, the query is executed. For information on using text analytics data within cubes, see the Advanced Modeling for InterSystems Business Intelligence. In an InterSystems KPI, each row returned by the query is a separate series of the KPI. The following shows some of the series of a KPI (as seen on the KPI test page, discussed later in this chapter). The series names are shown in the first column of the KPI Values table. The name of a series (by default), is the value in the first column returned by the query. A KPI also contains properties, each of which corresponds to a column in the returned data. In the previous example, the KPI has five properties. When you define a KPI, you can override these property names and their order. The KPI query can include parameters. These are called KPI filters, because they usually (but not always) filter the values returned by the KPI. The KPI test page shows all the available KPI filters. The KPI mechanism automatically provides a set of KPI filters for any KPI. A KPI can also define actions, which execute custom code. When you add a KPI to a dashboard, you can add controls to the dashboard to execute these actions. 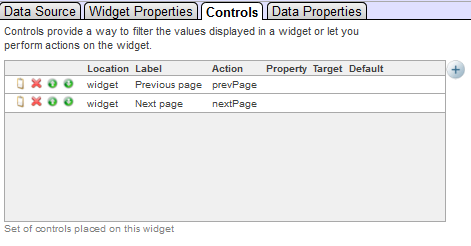 For any KPI based on a text analytics query that uses paging, that KPI defines the Previous page and Next page actions. %iKnow.DeepSee.GenericKPI  Use this for most queries. You specify the query in the next step. %iKnow.DeepSee.SourceListFilterKPI  Use this to display information about the sources. In this case, the system uses either the GetByEntities() or the GetByDomain() method of %iKnow.Queries.SourceAPI. Specify the integer ID of the domain. To do so, override the IKDOMAINID class parameter and set it equal to the integer ID of the text analytics domain. IKCUBENAME  Should equal the logical name of a cube. IKMEASURENAME  Should equal the local name of an NLP measure in the given cube. This technique is possible only if you are using the cube integration. For information on this and defining NLP measures, see the Advanced Modeling for InterSystems Business Intelligence. IKPAGESIZE  Should equal the number of rows to display on any page. The default is 10. Within dashboards, this affects the number of rows shown per page in a dashboard widget. IKQUERYNAME  (Only if you subclass %iKnow.DeepSee.GenericKPI) Should equal the name of a method in that class. /// This XData definition defines the KPI. Specify the name and displayName values as needed. Note that name should not include any spaces or punctuation. The value of displayName is localizable. You can omit displayName; by default, name is used. To test the KPI, use the drop-down lists in the Filters section. Then click Submit Query. These drop-down lists include all the available KPI filters; see the next subsection. Many of the queries include a filtermode argument that you use to specify the statistical reprocessing to perform after applying a filter; see “Filter Modes,” earlier in this book. When you use such queries directly, the default filtermode is $$$FILTERONLY, which performs no reprocessing. When you expose such queries as a KPI, the filtermode argument is always specified as $$$FILTERALLANDSORT, so that the frequency and spread statistics are recomputed and the results are re-sorted. Therefore you might see different results when using these queries as KPIs than when using them directly, depending on how you specify filtermode. 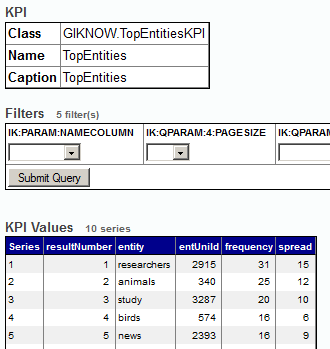 By default, any KPI based on %iKnow.DeepSee.GenericKPI exposes all result columns in the same order as the query result, with the same names as in the query result. You can modify the order, change names, and hide columns. When a user adds a pivot table widget based on a KPI, the properties are shown in the same order and with the same names as defined in the KPI, by default. When a user adds a scorecard widget based on a KPI, the user chooses the properties to display. The drop-down list of choices contains the properties in the same order and with the same names as defined in the KPI. 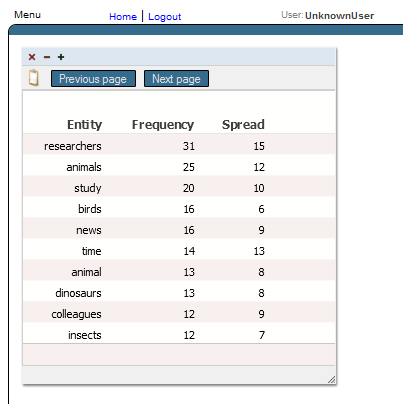 In both cases, users can modify the order of the KPI properties and change the titles displayed for them. For <property>, the value for name must exactly match the name of the field returned by the query. For displayName, use the name that should be visible to users. List the <property> elements in the desired order, and list all the properties that should be visible. For another example, see “Example Dashboard with KPI,” in the next section. To make a KPI available to users, you add it to a dashboard. 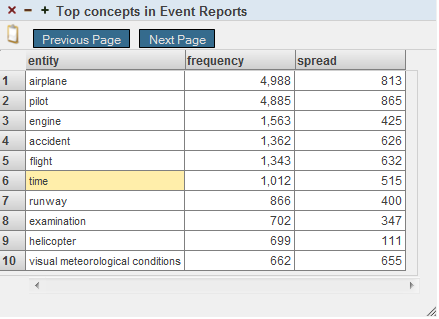 Users can then access the dashboard in various ways; see “Providing Access to Dashboards,” later in this chapter. In the Management Portal, click Analytics > User Portal and then click View. The system displays a dialog box that prompts you for basic information about the new dashboard. Type a value for Dashboard Name. Optionally specify a value for Folder. For Page Layout, click the third option (no workboxes). In the left area, click an item to show a list of choices. Select either a pivot table widget or a scorecard. Click the type of the widget to use. On the Data Source tab, click the Search button next to Data source. Click the name of the KPI. If you chose a scorecard, see “Configuring the Properties,” later in this section. Click OK to add this widget. Resize the widget and click Menu > Save again. For configuration options, see the next subsections. The last section of this chapter provides links to additional information. Click the Reconfigure button on the widget. Click the Add button to the right of the table, which is initially empty. For Filter, select Series name column. For Default Value, click the Add button . Select the name of the column to use (for example, entity for the KPI shown here). Click OK to add the default value. Click OK to add the control. Click OK to complete the widget reconfiguration. For a scorecard widget, you must configure the properties. No columns are shown by default. For a pivot table widget, you might need to configure the properties. All columns are shown by default. Click the Data Properties tab. On this tab, you specify the properties (or columns) of the KPI. To configure a property, click the Add button . For Data Value, select a value from the drop-down list; this lists the result columns of the KPI. Optionally type a caption into Label. Optionally type a format string into Format. By default, numeric values are shown with the thousands separator used in your locale. To format the numbers without the thousands separator, type # into Format. Click OK to complete the reconfiguration. The system displays a dialog box where you specify the control. For Action, select Previous page. Use similar steps to add the Next Page button. In the Management Portal, access the SAMPLES namespace. Click Analytics > User Portal and then click View. The system displays the requested dashboard. This widget displays the KPI defined in the class Aviation.KPI.TopConcepts. Your application can provide direct links to dashboards. You can provide a user portal that has the ability to display dashboards. You can use the InterSystems User Portal or create your own. The InterSystems User Portal is intended for direct use by end users. For information on creating dashboards, see Creating Dashboards. For information on accessing dashboards from your application, see “Accessing Dashboards from Your Application” in Implementing InterSystems Business Intelligence. For information on packaging dashboard definitions into classes, see “Packaging Analytics Elements into Classes” in Implementing InterSystems Business Intelligence. For information on the InterSystems User Portal and dashboards, see the Using Dashboards and the User Portal.